At the Annual Meeting of the Washington Association for the Education of Young Children, there was a fascinating presentation by educators and medical people on the importance of vision in teaching young children to read. One teacher, one educational administrator, one developmental optometrist, and one family practice doctor combined to present the stories of children who can't learn to read because of their vision. Only using one eye to see makes it hard to draw. Terri, a preschool teacher in Bothell, summed up, "This is all vital information people need to know. I will make every attempt to educate people as to the importance of early vision care." Why IS it that some children cannot learn to read? 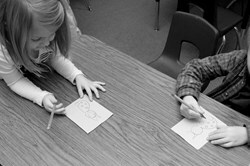 There are about 25% of first-graders whose eye are not aligned or who can not move their eyes automatically and efficiently across a line of print and down a page, line by line. This means that their eyes do not team together to focus on the words they are trying to see; their eyes can not move smoothly from word to word and from line to line as they are trying to make sense of print. So they will most probably always have limited success in school and in life, because they are non-readers. Since 80% of everything we humans do and know about involves our vision and our sense of sight, they will always be behind and/or unsuccessful. Teachers, mostly in the primary grades K-1-2, have been puzzled and worried about these children forever, and have suggested many other reasons for these children to be failing: no breakfast, laziness, ADHD, mixed-up or dysfunctional households, and of course, the catchall designations "learning disabilities" and "dyslexia." Dr. Bob McLaughlin, former principal and Superintendent of Washington's Union Gap School District, told riveting stories about the children in his school who could not read and how his district worked with many of them using Irlen colored overlays to clarify the print. His success stories were very moving. Mary Pellicer, MD, a family practice doctor from the Yakima Valley in Washington, spoke passionately about the lack of information, let alone training, that medical students receive about how children's vision works and how it can impact success in school. "Medical school does not teach about children's vision problems," Dr. Pellicer stated. "I graduated from the University of Washington Medical School and I am just now, many years later, learning about this problem." Dr. Benjamin Winters, who practices developmental optometry in Yakima, WA, connected the developmental stages of children from birth to school-age by explaining what and how they could see as they grew. He asked many of the participants, mostly early childhood educators and preschool teachers, which children in their care caused them concern. This theme was reinforced by Katie Johnson, author of Red Flags for Primary Teachers, who spoke about the first-grade children she works with who can't learn to read. "They are puzzles," she said. "It is the job of the teacher to solve the puzzle and help the child." Her most successful results come when she investigates and gets help for the problems children have with their vision. It was an inspiring morning. As Terri, a preschool teacher in Bothell, summed up, "This is all vital information people need to know. I will make every attempt to educate people as to the importance of early vision care."